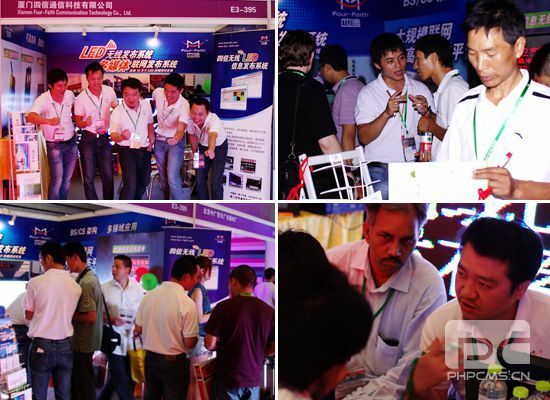 Seventh Shanghai International LED Exhibition kicked off on July 11, 2012 in Shanghai New International Expo Center, attracted nearly 600 Chinese and foreign exhibitors, 40,000 professional buyers visiting the exposition, the effective promotion of LED products and industrial applications around the LED products, exchange, cooperation and development. With the growing maturity of the LED products, increasing capacity of wireless networking publishing market based on the LED screen, LED Wireless Publish applications in all areas of life, widely used in elevator advertising, outdoor LED screen, corporate buildings, government agencies, banking and finance, mobile, Unicom, schools, hospitals, stations, airports, hotel club, chain of super, intelligent community. 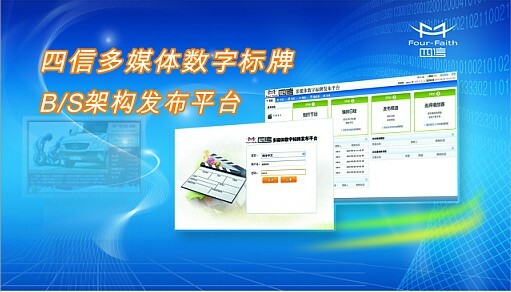 The four-faith communications professional in wireless communication terminals, industry application software product R & D, production and sales of high-tech enterprises. Product have traditional long-distance network-based 3G/4G wireless communication terminals, industrial IP (industrial wireless router the MODEM, industrial MODEM), based on the ZigBee short-range networking of wireless communication terminals, GPS-based positioning network wireless communication terminal the release of products, wireless LED application is a four-Faith focus on the layout of the field. 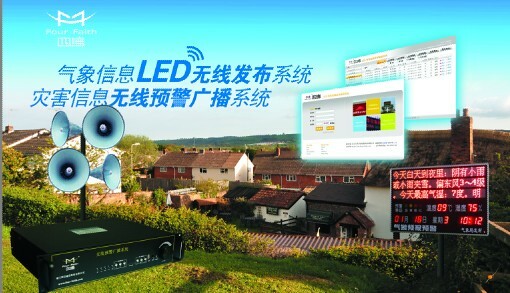 LCD wireless digital signage transmission system: to provide customers with intelligent digital signage for the terminal. Wireless meteorological disaster warning broadcasting and publishing system: mainly used in the meteorological department, disaster monitoring, real-time alarm and release. In this exhibition, the four-faith show customers the focus of technology. 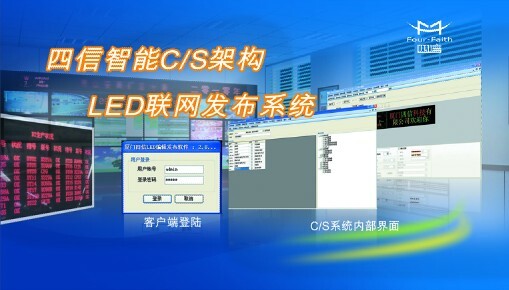 The newly developed intelligent C/S architecture LED networking publishing systems, multimedia B/S architecture publishing system, wireless meteorological disaster warning broadcasting and publishing system. Large-scale networking, and networking unlimited distances, information, real-time updates, Manage accurate and efficient advantage of much customer certainly. Smart C / S architecture LED networking publishing systems, PC-based open platform, composed of four large part of the multi-function release center, LED display, LED control card, dedicated LED intelligent terminal. Intelligent server database management, and can accommodate up to 5000 LED terminal at the same time online can support 3G, 4G, WIFI network hybrid network; system suitable for small and medium-sized project applications. Multimedia B / S architecture publishing system is based on a dedicated platform, a business promotion, real-time notification of all-round show a LED display and LCD high-definition multimedia display technology. Enables remote production, release, manage and update the program at any time, the system can play almost all formats of the mainstream media. Has a strong system stability and security, cost-effective. Wireless meteorological disaster warning broadcasting and publishing system is a four faith flash flood warning broadcast system innovation and sublimation of the wireless LED display, set "release" and "wireless text to speech emergency broadcast design in one, quick, timely,accurately provide a variety of wireless alarms and other services. The product can be effectively disaster prevention and mitigation, to attract a a lot of of government departments to come to to visit the guidance.